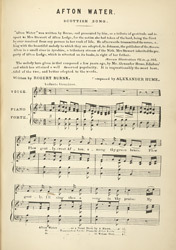 The words of this song were written by Robert Burns and the melody was composed by Alexander Hume. It is one of the most noteworthy examples of Burns' work. There has been much discussion as to Burn's motivation for writing it. Some say it was a tribute to 'Mary Campbell', the woman that he loved, others say that it is less complex and is simply an accolade to the River Afton intended for Johnson's Musical Museum. Burns loved the charming and romantic scenery of the banks of the river and sought to immortalise this in his poetry.